Mark making, rule breaking and A Christmas Carol (2010) | Randomwhoness: a Doctor Who blog by Johnny Spandrell. Sampling stories in random order. Christmas specials come in two varieties: the ones which are frothy but insubstantial festive fun, and those which are big event episodes, containing new Doctors, new companions, regenerations et al. On first glance, 2010’s A Christmas Carol looks like it falls into the first category, and true, it does lack a cast change or a Minogue calibre guest star which would single it out as event TV. But actually, I’d say it’s a deceptively important episode which stamps showrunner Steven Moffat’s mark on the series and changes it forever. A big call! Let’s see if I can back it up. We have to start with the previous story, The Pandorica Opens/The Big Bang. In this story, the Doctor (tweedy Matt Smith) reboots the universe, seemingly reversing the events of Series 5 and returning us to the fictional equivalent of a restore point. It is the most potent embodiment of a phrase that almost becomes Moffat’s mission statement for Doctor Who: time can be re-written. He effectively rewinds the tape to an earlier part of the story and starts again. As the climax to a story or story arc, it’s a trick to which Doctor Who had never before resorted. It’s the ‘Superman reverse time’ trick. A Christmas Carol goes a step further. It has long been one of Doctor Who‘s immutable rules that the Doctor cannot change history, and by inference, that he can’t change anyone’s personal history. In The Runaway Bride, he says “I couldn’t go back on someone’s personal timeline.” And in Smith and Jones he says “Crossing into established events is strictly forbidden.” Luckily he remembers to add “Except for cheap tricks”, because A Christmas Carol sets out to break all those rules. It happens to Kazran Sardick, our stand-in Scrooge, played with nuanced gravitas by Michael Gambon. In order to change Sardick’s mind on the subject of saving a crashing spacecraft full of passengers (which includes companions Amy and Rory), the Doctor embarks on an elaborate plan to change his personal history and make him a more compassionate person. He starts by travelling back in time to when Kazran was a boy (Laurence Belcher). As he does so, Sardick Snr realises his memories are changing, and he turns to the camera, aghast. For the first time in Doctor Who, someone’s time is being rewritten. From there on, the Doctor ducks and dives backwards and forwards across the old miser’s timeline. Like all children in Doctor Who, Sardick junior is entranced by Matt Smith’s playful Doctor. He arrives to babysit the kid, and before long they’re both being threatened by a giant flying shark. It’s the start of a great friendship between Time Lord and lonely boy; in each other, they find inquisitive, adventure seeking kindred spirits. A litany of successive Christmas eve adventures in the TARDIS ensue, with beautiful songstress Abigail (Katherine Jenkins) in tow. She’s been liberated from one of Kazran’s father’s cryogenic pods for people who haven’t paid their bills. The boy loves all this, and loves the Doctor. He even starts wearing a bow tie. As Sardick grows up to become a young man (Danny Horn), he and Abigail inevitably fall in love. But eventually Abigail fesses up to her new beau that she’s terminally ill and has only days to live. Days she’s been frittering away on Christmas Eve trips in the TARDIS, and now there’s but one left. Sardick grows resentful of the Doctor, who has given him a taste of a happy life, but who has also been gradually ruining it. He dismisses the Doctor with the ultimate insult – he’s grown bored – and disgustedly removes his bow tie. So Sardick grows up old and bitter, despite the Doctor’s remedial efforts on his timeline. And as this is a retelling of Dickens’ A Christmas Carol, we all know what has to happen next: the Doctor will show him a haunting vision of his future. Even Sardick knows it: “Fine. Do it. Show me. I’ll die cold, alone and afraid. Of course I will. We all do. What difference does showing me make?” he snarls. But Moffat pulls off a beautiful conjuring trick, again breaking all the rules. He brings Sardick’s childhood version to the future see what he’ll grow into. A perfect reversal of audience expectations. And the twists keep coming. Having established that the machine which could save the crashing spaceship will only work for Sardick, the Doctor’s shocked to find he’s changed the misanthrope too much, and the machine no longer recognises him. So Sardick’s forced to thaw out his lady love for the last day of her life, and the scene is set for something of a plotting marvel, in which every one of the story’s elements: Doctor, Sardick, Abigail, singing, shark, screwdriver and crashing spaceship combine to bring the story to a close. That’s hard to do, but Moffat makes it look easy. But for me, being an old Who stick in the mud, the Doctor’s new found willingness to run roughshod over time, initially spoiled A Christmas Carol for me. It seemed to me to be almost cheating – not playing by the rules. 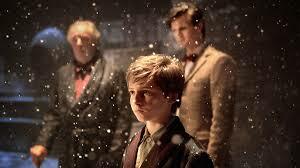 In Series 5 and now this Christmas special, Moffat had set out a bold and revolutionary agenda for the series. You bet time can be rewritten, and now so had Doctor Who. But since that first viewing, I’ve come to admire much about this episode, not just the intricate plotting I’ve traced through here. But also the quickfire rapidity of the jokes; it’s one of Moffat’s wittiest scripts. The pacy direction of Toby Haynes and the moody cinematography of Stephan Pehrsson. A towering performance by Gambon, who seems to effortlessly wring maximum meaning from every word and gesture. And Matt Smith at the peak of his powers, being both adolescent and ancient simultaneously. All this, and a marriage to Marilyn Monroe. It’s a thing of beauty and a reminder that sometimes to tell a story which is new and compelling, sometimes you need to break all the rules. ADVENTURES IN SUBTITLING: one of my favourite lines gets mangled when the Doctor’s Christmas instruction to a young boy, “stay off the naughty list” becomes the meaningless “stay off the naughtyness”. LINK TO Planet of Giants. In both the TARDIS doors open mid flight. But luckily this time, the “space pressure” doesn’t cause the Ship to miniaturise. Phew! NEXT TIME… You unspeakable abomination! We conduct The Sontaran Experiment.